Land Rovers are the ultimate luxury sports utility vehicle. They provide all-terrain cruising capabilities, but also cater to the everyday driver. Mike’s Auto Service knows Land Rover service and repair, which is why so many clients trust us with their Land Rover Discovery’s, Range Rovers, and more. Our ASE certified mechanics have more than 30 years of experience, and use all NAPA and OEM auto parts for Land Rover repair and needed replacements. 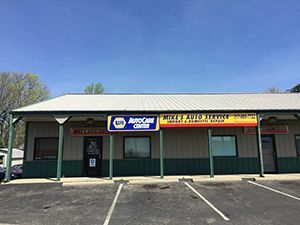 As a NAPA authorized auto care center, you can trust that your Land Rover is in the most capable hands in Greenwood, Indiana. Our family owned and operated auto shop is devoted to high-quality work and sincere customer service. When you bring your Land Rover into Mike’s Auto Service, we make your vehicle our top priority. We offer comprehensive automotive service for all model Land Rovers, old and new, including scheduled car maintenance, standard service, minor repairs, major repairs, replacements, and more. We also offer tow truck service, written estimates, and new customer discounts. Call our office today at 317-889-7722 to learn how to sustain performance levels and increase longevity in your Land Rover SUV.